Republicans and Republican-leaning independents are less confident about what lies ahead for their party than they were immediately following the election of Donald Trump last year. Pessimism about the GOP’s future remains a minority viewpoint among Republicans and Republican leaners. However, a Pew Research Center survey of 4,867 adults conducted Sept. 14-28 finds that the share of Republicans who are very or somewhat pessimistic about the future of their party has nearly doubled, from 20% in December to 39% in the current survey. 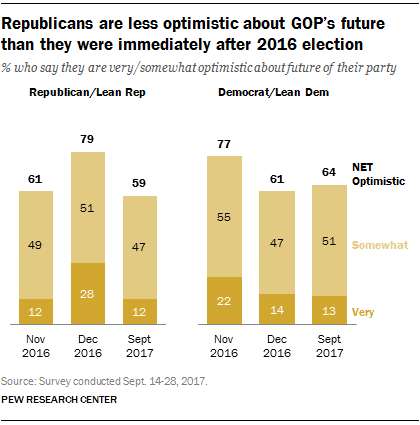 About six-in-ten Republicans (59%) say they are very (12%) or somewhat (47%) optimistic about the future of the Republican Party. In December 2016, nearly eight-in-ten (79%) said they were very (28%) or somewhat (51%) optimistic. Republican views are now comparable to what they were on the eve of the 2016 election: Last November, 61% expressed optimism about their party’s future. Though Democratic views are little changed since December, Democrats are now slightly more optimistic about their party than Republicans are about the GOP. Today 64% of Democrats and Democratic-leaning independents are either very (13%) or somewhat (51%) optimistic about their party’s future. Democratic optimism remains considerably lower than it was in the days before the 2016 election, when 77% of Democrats and Democratic leaners expressed optimism. The decline in optimism about the GOP’s future has occurred across most Republican subgroups. College-educated Republicans have seen a particularly sharp drop in their party outlook. In December, 73% of Republicans with a college degree said they were very or somewhat optimistic about the future of the Republican Party. In the September survey, just 44% say this – a drop of 29 percentage points. Among Republicans without a college degree, the share expressing optimism has also declined, but by just 16 points. By 65% to 33%, Republicans without a college degree continue to be more optimistic than pessimistic about the future of the party. Democratic views have shown little change since December and there are only modest differences in current attitudes across demographic groups. Note: See full topline results and methodology here (PDF).